Where's That Sound Coming From? : Man in the Middle Addendum--ON GUITAH..ACE FREHLEY!!! Man in the Middle Addendum--ON GUITAH..ACE FREHLEY!!! Today at work, a song I haven't heard or even thought of in YEARS randomly entered my consciousness. "I'm the kind of guy/who likes feelin' high/ (something something blah blah)/ AND I REALLY LIKE TO FLYYYYYEEE....Ohhhhh-zohhhhhnn...Ohhhhh-zohhhnnn"
Know what/who I'm talking about? It's pretty commonly believed that in the KISS paradigm, and KISS really did fancy themselves the glam metal Beatles, Ace Frehley was indeed the George Harrison: the lead guitarist whose head was in some spiritual otherworld, unconcerned with the attention that Paul and Gene battled over, and capable of writing some downright refreshing songs (again, in the KISS paradigm). And the one with the strongest solo debut. We never had to shield our eyes from Ace's bared chest--whether that was his choice or just maybe because he didn't have the bearskin rug that Paul had--and he really seemed more interested in his guitar than the blood and fire. Ok, so he had his smoking, glowing guitar, courtesy of Augusten Burroughs' brother, but Ace was the antithesis of Gene Simmons, and thus bane of Gene's existence. Gene was a simple bass player, said no to drugs, boinked anything that moved (and then took their Polaroid) and marketed the hell out of every last drop of urine he may have dribbled onto a toilet seat in a hotel in Buffalo (sorry for that image). Ace actually DID rock and roll all night and party every day. He lived the life that Paul and Gene only wrote about. 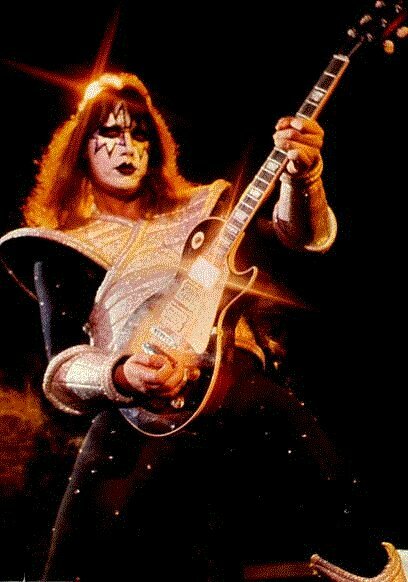 And Gene considered Ace the ultimate dummy for not marketing his lightening bolt guitar strap. Well, Gene may have had a point. Had he had better business sense, Ace would not have had to play places like The Vertex in Hadley, MA in 1994--treating the "crowd" (150 tops?) with racist jokes and a sad, lackluster performance. Yes, I was there. I was one of the rock and roll soldiers he kept addressing between songs. Of the Four Kiss Solo Albums that were released in 1979, Ace's is the only one that stands up as a listenable rock and roll record. Plus, no "best of KISS" is worth anything without Ace's songs "Cold Gin" and "Shock Me". When I was 6, and obsessed with KISS, Ace was not my favorite. In fact, I just wasn't very interested in him, because he didn't seem very interested in being in KISS. I suppose this is how young Monkees fans felt about Mike Nesmith. But you grow up and an reassess and learn that aloof and mysterious = cool. Not mugging for the camera. the always hip, perennial party fave, "New York Groove"
Lastly, oh jesus, you just gotta love Paul Stanley. How can you not? What is Paul Stanley? Who is Paul Stanley? Let's forget all of that and dig "Shock Me", sung by a no-doubt semi-toxic Ace.